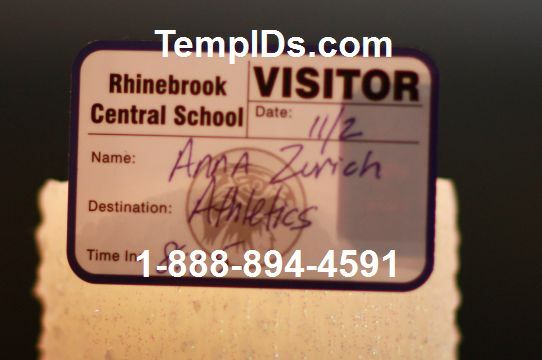 TempIDs.com is the leading source for your visitor badge needs. How many labels you would like per book -- 400 or 500? The 400 labels per book have a Time In Time Out Stub under the label which take up more space on the page than the 500 labels per book. Same price $125.99 per book with customization. Non-expiring is $50.00 cheaper per book. What information would you like printed on the book - most choose Name, Destination, Date:, and Time In. You tell us how to design the badge which includes a logo, location of words, and you can have Guest or nothing instead of Visitor. We can also print the visitor badge information in a foreign language. What border color you would like to use: red, yellow, green, blue, or black. How many books you would like to order. 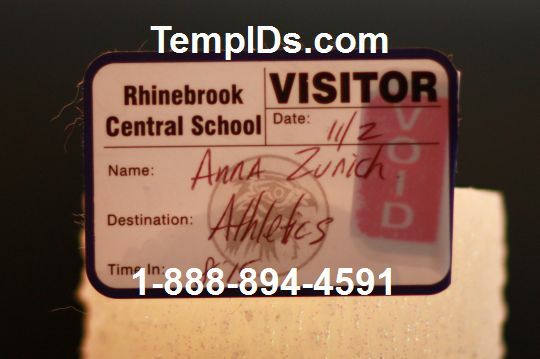 Our visitor badges with duplicate log are ideal for for schools, for hospitals, and for businesses to identify guests to your building with or without the self expiring option. DIYers may be interested in the expiring label sheets for laser printing version of this item. Don't forget about our Tardy Slips and Early Dismissal book forms with duplicate copy. 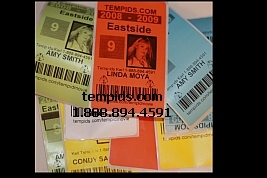 All things related to Visitor Badges -- labels, printer, software, and tech support -- TempIDs.com. Using our labels for your visitor ID badge, lets you know if someone is trying to use yesterday's badge again today.